So I just found out Shellie May is in the states and there is a Minnie princess outfit. I hope they have it when I go because I have a keychain version that I got when I first went to Disney, I currently have the same one on my Disney vans backpack because WHO NEEDS A PURSE? Without discounts, Day at the Park ShellieMay (I think "tourist" is better LOL) is cheaper online. But, my (severely discounted) 12" Duffy from the Disney Store Online has an extremely crooked nose, so there's certainly risk. Returns or exchanges of merchandise purchased from DisneyStore.com can be made to any Disney Store location in the continental United States in accordance with the in-Store Return Policy, excluding Personalized Items, Art, Limited Edition items (excluding apparel), Vinylmation, Mirrors, Electronics, Indoor and Outdoor Furniture, and Special Order merchandise. All returns must have the original packing slip/receipt with the merchandise to be returned or exchanged. Eeee-va, Duffette is also a heavily discounted 2011 bear that I bought online about the same time you bought yours, so I guess you could say they're related, hehe. The store ended up sending me a pretty good looking bear, so in that instance I got lucky. shellie may, you're probably right about Tourist Shellie being a companion to the Tourist Duffy in WDW (never understood why they didn't make a DL version??) and so there might not be plans to bring that Shellie here. I probably will be forced to buy one online. Knowing me though, even if the Shellie they send me isn't "perfect" I'd feel bad about sending her back so I'd still keep her and love her. Well, provided that she doesn't have her eyeballs sewed to the back of her head or something, LOL. That's interesting about the arms on the cheerleader bear. It never even occurred to me that they would be different from the normal arms. Thanks for the info! Yeah, Diznygirl, I have a gaggle of deeply discounted Duffy bears (I got 3 total from 2011 and then a bunch from 2014 that I figured I could make clothes for and maybe sell...ha ha ha yeah I'm lazy :P ). The first one I got, and the one I paid the most for, has a crooked nose, poor guy. But I got attached anyway. The other 2 I got online were fine, as were the ones I got at the Disney Store Outlet near me. An image search of the Disney Store website DOES come up with a Disneyland Resort version of the Duffy that shellie may referenced, at least, over here. I don't think the Disneyland version was anywhere near as widespread, though. I wonder if making ShellieMay non-park-specific was strategic. Without discounts, Day at the Park ShellieMay (I think &quot;tourist&quot; is better LOL) is cheaper online. How does that make any kind of sense?? Does that FIT Duffy? Or Gelatoni? It's great! I'm actually tempted! It says he's only 14 1/2 inches high, including the cap, so I'm going to say probably no. But the whole outfit is adorable and Eeee-va's right...should have been a Duffy! Looking at the cuffs, I'm not confident the clothes are even removable, unleas I missed a note in the description. I've seen similar ensembles for Build a Bear on eBay sans the cheap printed newsbag, though. Last edited by Eeee-va; 10-29-2015, 11:22 AM. If we are talking about the tourist Shellie May, it looks to me that her clothes could be snipped and removed. Disclaimer..... I did not buy her, but wanted to make sure she was all fur bodied and not the horrible faux clothed bear. Thanks very much, mmommie! I'm hoping to buy a tourist Shellie May someday, so it's good to know I can probably make new clothes for her. But I was talking about the Newsies non-Duffy bear; I linked to it a ways up. Well, looks like I waited too long as both the 17" and 12" ShellieMays are no longer listed on Disneystore.com. Hard telling when they will restock. Also looks like the online price of Duffy has been bumped up to the $33 he now sells for at the parks. The yourwdwstore.com place is carrying the 12" Shellies right now but generally charges about $10 more per item. I noticed also the yourwdw is currently out of the Duffy backpacks and the backpacks are currently discounted on the disneystore site. Maybe last call for that little guy? I have found him to be such a wonderful companion at the parks. My other bears can have a rest and I can have both hands free ! As part of the park's 10th Anniversary celebrations, new merchandise is being released. One of them is a series of Tsum Tsum being released, two of them featuring Duffy and ShellieMay. Ok, I have to make an observational comment. 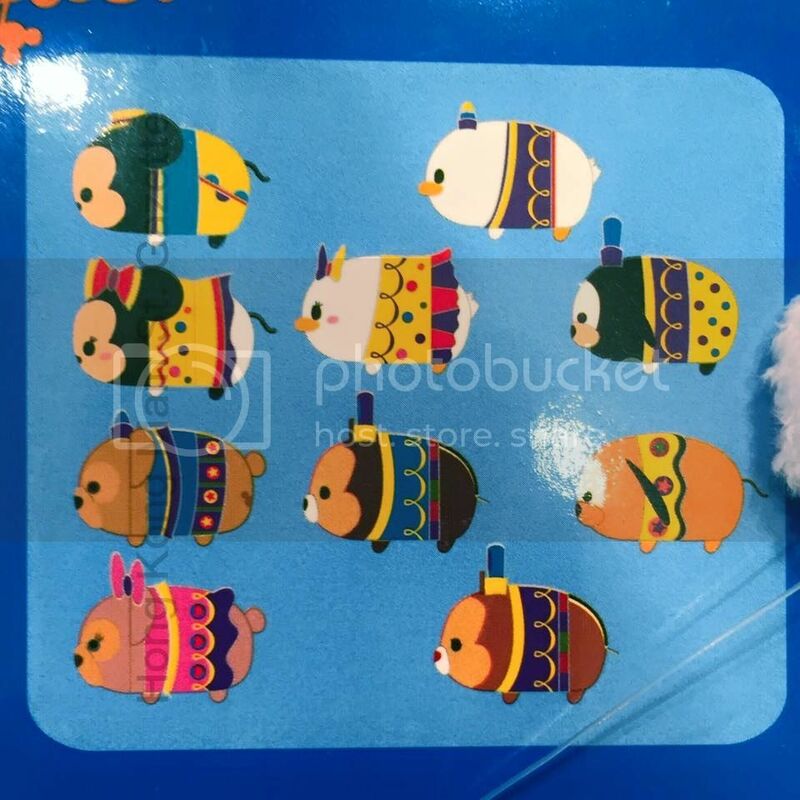 I don't quite understand why Duffy Tsum Tsum have been so embraced in Hong Kong and have never been released in Japan. I don't get it. Why HKDL gets Duffy Tsum Tsum and TDR and Japan see absolutely nothing. Also, is it just me, or are the Duffy releases at HKDL sort of weird? I mean, they are kind of cute, but at the same time, lesser derivatives of anything that TDS has released. I admire that HKDL tries, but if you put things side-by-side, there is no comparison. It's strange though, I like that HKDL is obviously putting some effort into creating new costumes for Duffy and ShellieMay, but something is lacking. There's an intangible "specialness" that is missing. The Christmas costumes are cute, but at the same time, odd. Duffy wearing jean shorts with a sweater? The quasi-Home Sweet Christmas looks, but not quite? The middle ground that HKDL likes to strike between bland Disney costumes and OLC designed fantasticness. And please don't think I'm being snobbish about it. I just want Disney to create something with a more cohesive aesthetic that doesn't even have to match OLC levels of quality, but does something uniquely their own. I feel like HKDL has not broken free of that, they are relying on previous OLC designs, but making cheaper, less interesting versions of them rather than creating their own designs. Although with the HKDL 10th anniversary, we are approaching that. A Simba outfit is well overdue at this point!! I almost find Hong Kong releases worse than US releases because there's just so much of it. With the US, you can be kind of totally dismissive about it. "That's not Duffy. Move on." But with Hong Kong, because they use them so much and just mix them up with all the other characters, it actively erodes the unique traits that define Duffy. It muddies the characters and the brand, the identity. It's frustrating to the point that I kind of wish HKDL would just stop. I've never been there, so I don't really know, but the way they've handled Duffy and ShellieMay really makes me feel like the characters there are "theme park characters," like if they were characters for a zoo or a restaurant or something. There's something hollow to me about the approach. "Hollow" is the opposite of Duffy. Duffy is stuffed full of good stuff. I am also really shocked at the Tsum Tsum thing in HKDL. The fact that they had Duffy and ShellieMay, and they have consistently released different holiday and themed versions of them, while they don't exist at all in Japan (where Tsum Tsum originated) is so odd to me. Why would Japan not have Duffy Tsum Tsum first, and why would they now still not make him available in his home country? It makes me wonder if OLC really does have some kind of clause that Duffy cannot be made for sale in any form outside of the parks in Japan (the bootleg claw machines don't count). And, unlike when Duffy came to the U.S. again and was sold in Disney Stores; Duffy in Japan has never ever been sold at Disney Stores. I believe that's why UniBEARsity exists at all, to capitalize on the Duffy craze because they couldn't sell him directly in the stores. I would LOVE to know the business behind these decisions, and why Duffy is treated so exclusively in Japan, but not elsewhere around the world.